Does your house have a problem with settling or sunken concrete? Contact a foundation repair expert for a permanent concrete repair. Watch the video to see why PolyLevel® is a smart mudjacking alternative and superior concrete repair solution. Settled or sunken concrete is a common problem in and around the home. It shows up gradually, as the soil beneath a concrete slab or other element begins to compress or settle. Eventually, you notice that a concrete patio is tilting the wrong way, that a set of precast concrete stairs is leaning away from the house or that a section of a concrete walkway has sunken down, creating a tripping hazard. If you have a cracked, settled concrete slab that you need repaired, contact Quality 1st Basements to speak with a specialist about your needs. Call us at 1-844-237-3440 or click the button below to request your on-site inspection and concrete leveling estimate today! We lift and level concrete throughout New York City including Staten Island. Concrete settlement typically occurs because the soil beneath the concrete element simply can't support the weight of the material. Even though there's nothing wrong with the concrete itself, many home repair contractors recommend demolishing the settled concrete and then forming and pouring a new slab in its place. The demolition and new construction strategy will certainly work, but it's expensive, disruptive and time-consuming. Foundation repair specialists can often repair sunken concrete using proven concrete lifting and slab leveling techniques. Instead of demolishing the sunken concrete, they can overcome weak soil problems and restore the concrete to its proper level. Most of these nondestructive concrete repairs can be completed in less than a day. There are no trips to the landfill, and there's no need to wait for freshly poured concrete to cure. 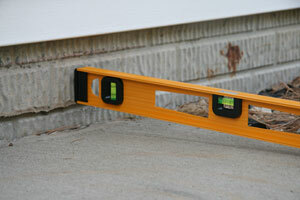 We can fix the concrete of your NYC or Staten Island home without destroying the concrete. Concrete repair contractors have special equipment and innovative techniques for raising sunken concrete. Polymer injection - also known as urethane injection - is an excellent example of this technology. The polyurethane concrete leveling technique involves pumping urethane foam beneath the settled concrete. A chemical reaction causes the foam to expand with powerful force. The foam pushes the settled concrete up toward its proper position, while also flowing into loose soil and filling voids caused by soil settlement. An experienced technician knows just the right amount of foam to inject. Within just a couple of minutes, the foam hardens and attains around 90% of its final strength. The cured foam is light, strong, waterproof and chemically inert; it won't degrade or harm the environment. 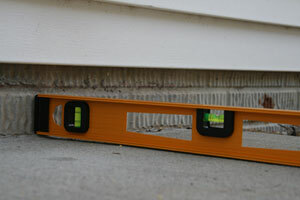 Polymer injection is an excellent technique for lifting sunken concrete slabs, such as driveways, garage floors, stoops, patios and other exterior concrete. We are your experienced concrete leveling contractor serving New York City including Staten Island. 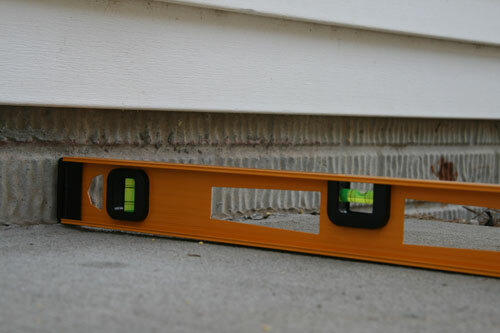 When a footing or foundation wall sinks down, causing cracks in the foundation and settlement issues in upper floors of the house, another concrete lifting technique is usually called for. Foundation repair specialists often drive steel piers into the soil to correct sinking or sunken foundation walls, chimneys and precast stairs. A helical pier functions like a huge screw, advancing into the soil as it's turned. A straight steel push pier often relies on the weight of the building to push it into the soil. With both piering techniques, the goal is to bypass weak soil directly beneath the foundation and connect the foundation with solid, load-bearing soil at greater depth. A strong steel bracket connects the top of each pier to the foundation, enabling technicians to elevate the bracket on the pier, thus lifting the settled concrete. We offer a variety of foundation repair solutions for settled foundations, bowing basement walls, wall cracks and more. Contact us to discuss your concrete repair needs and we will send one of our trained specialists to your home to complete an inspection of your slab and provide you with a free estimate for the repair work. Quality 1st Basements offers residential and commercial concrete leveling and foundation repair services in Brooklyn, New York City, Bronx, Flushing, Staten Island, Manhattan, Queens, Elmhurst, Ridgewood, Astoria and nearby!